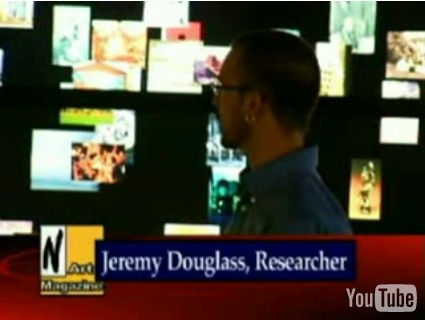 The Software Studies project "Visualizing Cultural Patterns" appeared in a video clip by N Art Magazine as part of a feature on researchers at the Center for Research in Computing and the Arts, Calit2. The clip was aired by ABC on Sunday 10/26/08 at 4PM PST. The spot was recorded by Jeremy Douglass, with the HIPerWall being run by So Yamaoka (not pictured).